BlazerChalet.com: What IS that thing? Here's a bunch of questions that I get asked frequently, and are intended to be helpful for owners, potential owners and enthusiasts alike. Q: What exactly IS a Blazer Chalet? Inside you'll find a propane heater and stove; water tank and sink, and either an icebox or a fridge. Shelves, closets and a removable tabletop round out the furnishings. (They did not, however come with a shower or toilet.) In short, it's a home away from home, for a couple of people for the weekend. It's not suited for large families or long-term camping; consider it a weekend camper and not a full-fledged RV. Q: Does the camper come off? A:No, not like the stock hard top. It's made to be mounted permanently, so you can't just take it off and put it on like your hardtop. Besides the structural issues involved (the fiberglass will crack!) the appliances and associated cabinetry make it just too heavy to take off safely and without damage. It does un-bolt the same way the hardtop does, so every decade or two you can take it off for repairs. Note that there are other aftermarket brands -- notably the "Four Wheel" brand -- of popup camper inserts for Blazers which ARE removable. They're lightweight, don't necessarily have the appliances and so forth, and haven't been made in 20+ years either ;-( See Other Campersfor pix of other similar camper units. I paid $3900 for my former Chalet. Some small rust bubble repair and repainting of the fender tops and hood, along with proper restoration of the camper stripes and door decal would have made it near-factory-looking in appearance. The interior was very good, but it needed factory original seats and other repairs to really get it right. I ended up putting my money into drivetrain refurbishment from it sitting idle for too long, and the horrible Chinook rear door needed to be rebuilt, along with new tires and other bits. This ended up being about $4500 worth of parts & hired labor altogether. To fix more worn-out bits like weatherstripping & the faulty fuel sender + more cosmetic items, I could have plowed another $2-3 grand into it. So, you end up with something in my case looking like near-showroom new, with a breakeven price of $11-12 grand. Basically, that's how I price these - it depends entirely of how much a person really wants one vs. how much work they want to or can afford to put into 'em. Not a lick of work for a really pretty one = around $15 grand or less at the present time, judging from all the sales and auctions I see. A not-so-perfect altered one that is mechanically sound might require $6 grand worth of work to make it look original again, thus it arguably is only worth $6-ish grand. A non-rusty one that's been stored non-running for years will probably need $3 grand just to make it roadworthy and maybe more just to clean up the interior, so you back off the value of it by that much again. Some people will protest, noting how Chalet #1385 sold on eBay in November 2011 tor $21,500 in what appears to be a private sale (Chalet #0058 sold for $17 grand at the Raleigh Classic car auction to a southern California classic car dealer in December 2007, but that buyer ended up selling it at the Barrett-Jackson Jan 2009 auction for $9,350). However, I printed out the bid history of #1385. The winning bidder was the only bidder past the $10 grand point, taking it up to its reserve price. It appears the bidder was unaware of others in comparable condition, priced half as much, or else was just unconcerned with how much it took to buy one. Camper units alone are a whole different story, when you consider these vehicles came from the dealerships as complete units that were built that way by GM, not as some add-on installed by dealers. Thus, the camper unit alone is not what makes any Blazer from that time period more valuable, it is the two combined in their original form from the factory to the dealership, so it is not a good idea to separate the truck from the camper unit unless terminal rust or other problems makes the truck unsalvageable. Guys who like the looks of these camper units do want them for installation on non-original newer modded Blazers, but from all the various sales I've seen, the value of orphaned camper units tends to be - with just two exceptions I'm aware of - around $200 - $500. So, more power to anyone who can raise the relative collector value of these as complete units. The problem is found with buyers who discover too late that they could have gotten one in similar shape for much less money. Are sellers who ask exorbitant prices for these guilty of something. Well, not really, harsh as it sounds, it is incumbent on buyers to do some basic research about what they are buying. Q: Can I take the camper unit off and put it on another Blazer? What years? A:Absolutely! Note that this isn't a one-day proposition; I'd expect a long (three-day?) weekend at bare minimum if you aren't doing any fiberglass repair. If you are going to be patching, allow yourself plenty of time. The camper will fit on any full-size Blazer/Jimmy from 1976 to 1991. In 1992 GM switched to the new body style with the attached roof (sigh, the end of an era.) After 1977, however, the rear floor changed, so you'll have some drilling to do to bolt the camper down, on a 1978 or later vehicle. Unless you can find a rust-free 1976-77 model (for best fit), my recommendation is a 1987-1991 truck. I pick those years as they have the TBI fuel injection and get decent fuel economy (relatively ;-). On your new truck, you'll need to remove the top, the tailgate, and the rear seat and interior panels. Q: So can I go off-roading in one? Seriously, it depends on what you mean by "off-roading". The Blazer, and hence the Blazer Chalet, is quite capable on logging roads or fire trails. If your idea of off-roading is the Rubicon, the Chalet will take you there, but you'd better have another truck for the trail itself. The Chalet is a great way to go hunting, fishing, camping, kayaking, or whatever other outdoor activity you enjoy -- it will get you from here to there, and then let you sleep in comfort when you get there! Q: What does a Chalet drive like? This depends on if you're used to driving a full-size rig to begin with. For those folks used to driving a Blazer or other full-size truck, it's very similar. They brake a little slower due to the weight and its distribution (lots more weight on the back, unlike most trucks). Handling is the biggest change; the added wind resistance can be challenging, and the camper raises the center of gravity up considerably. There are things you can do to address these concerns; see the Techsection for details. If you're not used to driving a full-size rig, however, you have two learning curves -- one of driving a seven foot wide, three ton truck, and one of driving that truck with the aforementioned wart on it ;-) Fear not, the Blazer is actually a very nimble vehicle. Friends and family often express their surprise at the places my Blazers can fit, both off-road and in the urban jungles of parking lots and highways. The steering radius is not much greater than the car you drive now, and the truck sits high enough to give you a comfortable view of the road ahead, without being impossible to get in and out of. The big engine provides reasonable acceleration, to merge into traffic and so forth, and, given the size of the vehicle, braking is adequate as well. While you can't expect it to handle like a Corvette, the Chalet isn't an eighteen wheeler either. Another concern is the rear overhang -- get comfortable with your side mirrors; backing up can be fun! I compare it to driving my Suburban: it takes some getting used to but it's fine once that sets in. You may find that side visibility is improved by leaving the side cushions down in the back; obviously if you have human passengers back there this isn't an option. The rear window is microscopic; while it works OK on the highway to show you who's behind, it's not very useful in parking lots. Q: Wow, they sound big. Do they fit through drive-throughs? How about car washes? A:Of course! They're not THAT big. With the top folded down they're less than eight feet tall (seven foot nine with factory size tires), so you'll easily fit under the 9' McDonald's and Texaco signs. I would not, however, recommend taking it through the drive-through car wash. It's too damn tall and funny shaped. Splurge and take it to a hand-wash place, or just hose it down yourself. Q: Do I have to fasten the top down before I drive? A:YES! If you don't -- or heaven forbid, you drive with the top popped up -- the top will ease up, and then fly off and impale the Honda following you, much to your chagrin (and that of your insurance company.) Seriously, the pop-up mechanism is not structural and can't withstand driving-speed winds. Make sure that all five tie down straps are tight, or you may get unpleasantly surprised when a semi passes! Q: Can I put a cargo carrier on top of the pop-top? A:No. 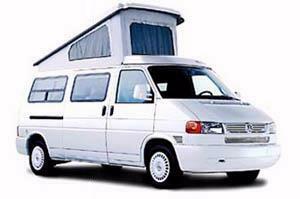 The camper's roof has a very thin wood frame (it's made to be light) and cannot support any additional weight. This means no roof rack, and no climbing on it! For extra storage, you can get a tray that plugs into a receiver hitch [pic] (though in the back, you have to be careful not to block the door :) I am not aware of any off-the-shelf fronthitches for this era trucks (only for the 1981+ models), but you could have one custom-made. There's a Chalet with a fantastic fishing set-up on the front for coolers (bait and munchies! :), rod holders, etc. I don't think I'd drive with stuff on the front -- the spare is big enough -- but it'd be a great aid once landed. Alternately, you could tow a little cargo trailer (see next question). Q: Can I tow with a Chalet? This means that a small boat, utility or travel trailer is within the weight limits. As with any towing, drive carefully and allot extra time. Be sure your brakes and steering are in tip-top shape (see the Techsection), and install the biggest auxiliary transmission cooler you can find. The TH-350 in your Chalet will handle the camper fine, but needs help to pull anything more. 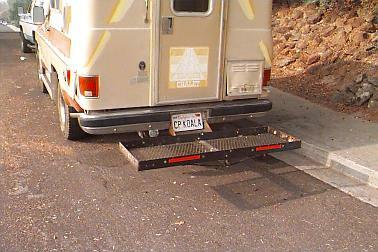 Why such a low limit on towing with the Chalet? The reasons are likely threefold: the overall handling of the vehicle (steering and brakes), weight limits on the axles, and the mounting of the hitch. The overall handling is addressed above and on the Tech page. The half-ton axles of the Blazer, while stout, are at their rated maximum on the Chalet with the additional weight of the camper unit. Finally, the hitch on a Chalet is mounted to frame extensions, not to the frame itself. While they are thick steel and bolted to the frame of the truck itself (presumably with grade 8 hardware ... gulp, I hope! ), this is another weak link in the chain which has limits. Q: What kind of fuel economy can I expect? A:It is worthwhile to note that the Chalet is a prime example of 1970's technology, or rather, lack thereof. While it features electronic ignition and power steering and might have cruise control, you should not expect the luxuries of today's vehicles. Q: Do you have any more pictures or information? A:Absolutely! Zip up top and check out the Photos, Other Chalets, Other Campers, Paperwork, and Links sections. Q: Where else can I find information about these camper/trucks? A: I'm not aware of any other Chalet-specific web sites besides this one (and its predecessor on Slosh.com). There are, however, lots and lots of pages with general Blazer information which apply to the Chalet; see the Linkspages for recommendations. A:A coupla years ago I heard from a friendly fellow named Doug in Arizona, who had just brought home a Chalet insert without a Blazer, and wondered if I knew anything about them. (CO-K5 folks will know Doug as K5 NUTT or AZBLAZER.) Shortly thereafter Doug happened upon a complete Chalet (ie truck and camper). He kept that complete one, and I bought the insert from him (dragging it back some 750 miles one way, where it ended up about thirty miles from where it started!). I've torn that shell down to the bare fiberglass and started repairing it as I put it back together. I may chop up a Burb someday and mount the camper to it, making it a 3/4 ton Blazer crew-cab camper ... but then the prospect of building up a TBI Chalet is kinda nice too. Hmm, so many options. In the meantime, I also bought another (mostly) complete Blazer Chalet. This one came from Las Vegas after spending its life in the desert, so it's rust-free, but dusty. She's more or less road-worthy and I'm looking forward to using her in the interim while I work on the other shell. Should you be parting out a Chalet or know where there's a parts unit available, please let me know. I'm always looking for bits and pieces for my campers, or can find someone who needs them. Q: So you're not Doug?